Charlie Bears Flurry Minimo Discounts Apply ! Designed by Isabelle Lee for Charlie Bears 2015 10th Anniversary Minimo Collection. 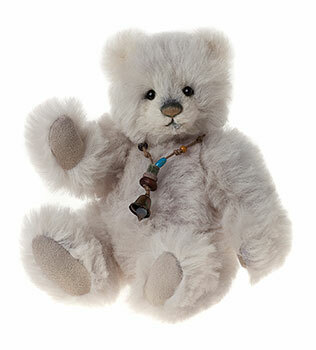 Flurry is fully jointed and hand finished in Dense Fluffy Shades of White Alpaca has a Lovely Necklace around the neck. Made of the finest schulte Alpaca, Hand stitch Nose and glass eyes made in the UK. Limited Edition of 2000 worldwide. Comes with a numbered certificate of authenticity & FREE Limited Edition Charlie Bears Cotton Canvas Drawstring Bag.